With the release of Meat Cleaver Survivors and off-class Survivors can have a little more reliability with their weaponry. Minh immediately jumped to my mind with her reasonable sanity, her ability to pass any test with skill cards and given how she is often built around cheap disposable allies. Have a weapon out and start slicing monsters while discovering clues, never failing a test. You want to put a weapon down pretty early, should it be Fire Axe or Meat Cleaver so I advise hard mulliganing for it. If you happen to draw an enemy while you have no weapon it’s not a big deal as Minh can evade well by committing cards and using her ability. Once you have weapon down, refrain from playing a second one as you want Able Bodied to be at its maximum. This deck also use the Miskatonic academic army with Art Student, Laboratory Assistant and A Chance Encounter. They are handy for their enter play effect but also as horror soak for the Meat Cleaver. Investigating should be done conventionally by committing cards and Art Student should help with high shroud locations. Speaking of Meat Cleaver, the deck includes both Lucky! and Live and Learn to insure you hit with it and didn't take a horror for nothing. As always with Minh you wan't to be prepared for dealing with The King in Yellow : Inquiring Mind, Unexpected Courage and even Able Bodied will give you all the icons you need to get rid of that awful weakness. I you play Carcosa, Corrosion can be devastating for this deck. Be sure to not end your turn on a high shroud location or consider upgrading into A Test of Will or Forewarned. The cost curve is low and I considered including Dark Horse but finally chose not to because this deck wants to play its allies and A Chance Encounter pretty often. More over Dark Horse is good with Fire Axe, less so with Meat Cleaver. There's not other items beside the 2 weapons because I want Able Bodied to always be at its maximum. Barricade is a questionnable choice. I like it for its icons but I guess it could be replaced with something else. Suggestions welcomed! As far as upgrading is concerned, you could go the easy route by upgrading cards already in the deck : A Chance Encounter, Lucky!, Preposterous Sketches, Barricade. Charisma is also a good choice so you can juggle with allies more easily. The allies in this deck are not unique so you can have both out. Higher Education can be interesting as a late buy. The amount of resources you sit on really depends on which of the 2 weapons you put down : with Fire Axe you are low and will not be able to trigger Higher Education often. I would also consider Stroke of Luck as a replacement for Live and Learn. 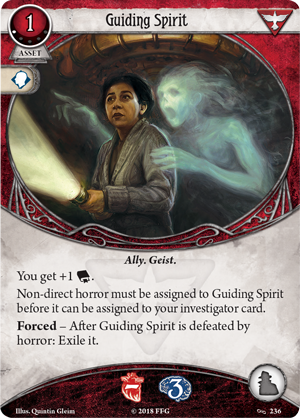 With the release of Union and Disillusion, I think the Guiding Spirit can be a good option. This is really genuinely clever! Not sure I agree with your final point there. Guiding Spirit clashes quite badly with Meat Cleaver. I know you can take horror on your Miskatonic allies but they won’t last very long, and then you’re taking all the horror on your ghost. Unless of course you don’t mind him being exiled. I understand but in my experience with this deck you only need to take horror while using the cleaver 2 or 3 times during a scenario. Indeed I found my self taking horror from treacheries on Minh herself to get to 3 remaining sanity (thus getting the extra combat bonus on the cleaver). From there I bounce between 4 and 5 horror (taking 1 to for bonus damage, healing 1 after defeating). Allies are there for horror offload. The meat cleaver can't heal allies though, and the guiding spirit has to take horror before Minh. You'll take horror on the spirit and heal it on Minh, so the spirit dies and is exiled. Peter Sylvestre looks like a better choice to do that IMHO. @DAAAN You're right, I forgot that clause on the Spirit.